This one on one drill has the defense start on the top of the circle and the forward start along the wall on the blue line. The inactive forwards and defense should all line up in the center circle. Place cones as shown to mark where players need to skate around. A puck is place on the red line by the coach. 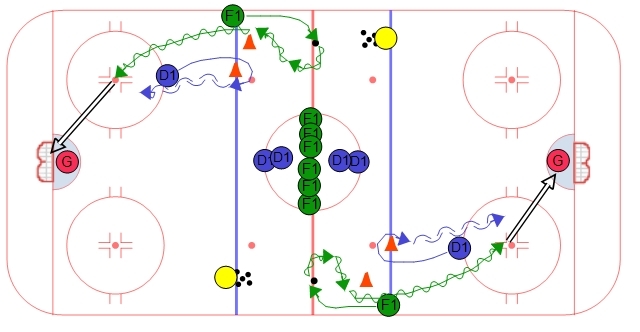 On the whistle the forward will skate up the red line, retrieve the puck, and make a tight turn to attack the defense. They need to skate wide around the cone (as shown) and then attack the defense as the enter the zone wide. The defense will skate up and transistion towards the inside of the ice and then take on the forward in a one on one. The key for the defense is to use the dots as a guide and make sure the forward stays to the outside using a good gap and good stick positition. They should try to force the forward into a bad angle shot and if they try to go to the inside they should be ready with good body position or stick. Forwards should take what the defense gives them. If they give them too much space then take the inside. If the defense does not give them the middle then they should protect the puck and drive wide.